As I've probably mentioned in early parts of this paper, when designing something new like this, I like for it to take a long time. Between each step in development I like to put the project on ice for at least several months. I like to do this because each time I thaw it out and get back into it, I see it as if I was a different person. This eliminates infatuation and proud papa syndrome and breaks any desire to stay on the same road I was on when I stopped. You know, things in motion tend to want to stay in motion. In Part 3 of this paper I had reached a point where I was happy enough with the results for myself but worried about making it user friendly enough to publish or sell. So after Part 3 was written I put the project on ice. 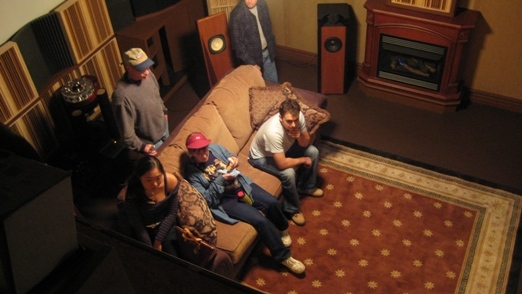 Above is a photo taken in my then unfinished listening room with the speakers set up as they were in Part 3. The broadcast speakers (HDTs) are just out of the frame on either side of the Open Baffles. Meanwhile I had a listening room to complete before I could continue any honest evaluations. (I also had to bring the listening room to near completion because it's been on ice since last year's DECFEST). My plan was simple. Get the room done, and during Decfest, set the system up and demo it. It will be the first time I've heard it since I put it on ice after part 3. That should put some substantial pressure on me, and an excellent real world test. It's either going to bomb badly or it's not. Something did happen to the speakers themselves while they were on ice. I robbed one of the drivers to help a desperate audiophile out in a time of need. I had been using our DFR8 full range driver but wanted to try the shielded version of the DFR8 in these cabinets since it has a much more streamline magnet assembly shown above. Naturally since the speakers were on ice, and I'm a man cursed with having to wear too many hats, I waited until a few nights before the DECFEST and built a new pair of shielded DFR8s. I then bench-tested them and that was it. Yes, believe it or not I'm going to present the ZOB at the fest using brand new drivers with a total burn in of 10 minutes. I figure if the ZOB impresses with these handicaps in place then I'm solidly on track with the design. The fest finally came and I set up ZOB just as it had been before, only the room around it has been largely finished. BTW, I didn't get to complete the room until three nights before the fest so I had no idea what to expect from anything we heard in there. With a room packed full of onlookers, I set up the microphones and was concerned about trying very hard NOT to set the gain too high so as to spare us all the horrible sound of low frequency feedback. So by the time I had music playing so that I could blend in the broadcast speakers - and I remember thinking how odd it was that I was already hearing plenty of bass and hadn't yet turned the broadcast on! Well, no time to process that so I turned on the broadcast speakers with less gain than I recall from before, putting me farther away from the yellow zone of potential feedback or booming. That was a good thing, I could relax. My listening to them was only brief enough to make sure that nothing sounded bad, and then I continued to mingle with everyone. It did sound really good. Smooth with nice weight. The broadcast was completely transparent. The frequency balance seemed better than before. I noticed they remained set up and in use for a very long time meaning they were able to hold peoples attention better than other speakers. In a fest environment holding anyone's attention more than several minutes is hard to do if you're a speaker or an amplifier! So I considered the first real world test a success. I set the ZOB up exactly as I had it at the end of part 3 of this paper and let about 40 people listen to it without my intervention or presence in the room. A) The speaker is now usable on its own - something I had given up on for the most part. B) The bass is largely absent below 40 Hz, but above this it is full and incredibly flat sounding. It's hard, if not impossible, to aggravate it with complex bass lines. This is absolutely the cleanest bass I've ever heard next to my Acoustats. C) Imaging varies with sources and recordings more than it does with other speakers. D) Imaging ranges from one to six feet outside the speakers and between eight and 30 feet to the back limit of the sound stage. Presence and detail are almost in a new league, may even be a benchmark. E) Good recordings sound good. Great recordings sound completely real depending on the source used. 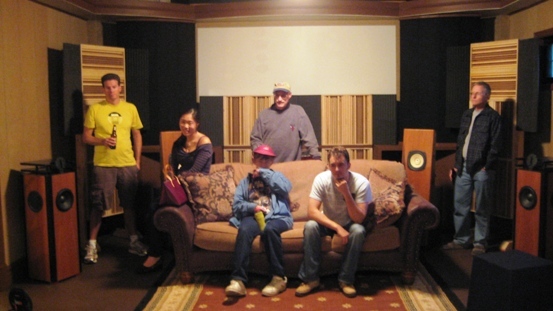 Bad recordings get thin sounding, making the speakers seem too present. G) A foam tile was temporarily placed behind the driver on top of the adjustable slot panel to create more division between the port and the rear wave of the speaker. It seemed to improve the coupling between the driver and the chamber below. 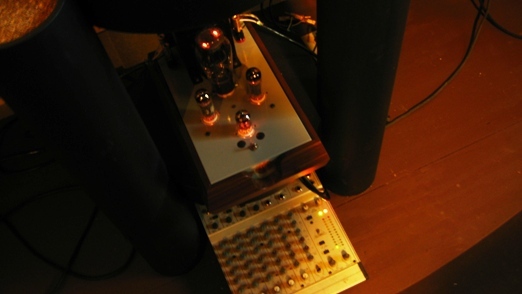 H) A two watt Zen Triode amplifier has a much weight as the 25 watt Torii MK II with these speakers, or put another way, the bass (frequency balance) of each sounds about the same. 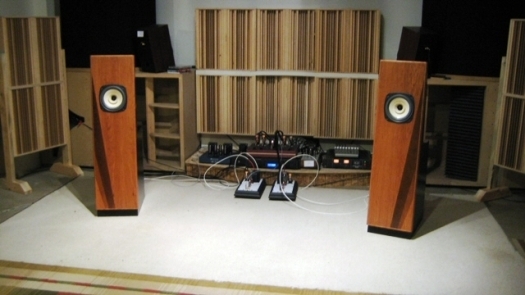 On the box speakers, a Torii MK II will usually develop noticeably more visceral bass than a Zen Triode. Also for most of my listening, the playback level was the same for both amps. I used the TORII MK II for the majority of my listening simply because it is a less forgiving amplifier and also because it is capable of complex feats of effortlessness in classical music at louder playback levels. A great amplifier to judge how good a speaker really is. I) With the exception of my Acoustats, never before had I experienced such a wide gap between the sound quality of different sources and recordings. This is consistent with past experiences in that when an audio system gets too transparent, the contrast between good and great recordings becomes so huge that you can only bear to listen to your best recordings, substantially reducing the content of your music library. After spending a week with the open baffles all by themselves, I wanted to hear what they would do with the broadcast system added again. However, this time after some study of the room I realized I might be able to use my Imperial SO horns at the opposite end of the room to effect a similar wave front at the arc of the speakers by just jacking with the phase angle. I set up a two-watt Zen amp to drive the Imperials (shown above) and re-installed the microphones in the open baffle cabinets. Remember, now more than ever, the broadcast system is an ambience tool with the added benefit of introducing a controllable amount of weight and scale to the playback. (Before, it was almost a requirement just to have a usable frequency balance.) The broadcast has shifted from a requirement to a luxury. I got lucky with the phase angle and the wavefront from the Imperial SO cabinets, and if you study the room shape you may be able to see why this worked so well. The broadcast system is turned on but just to the point of being detectable no more. I don't want to be aware of the broadcast speakers in the listening position or anywhere in the room as I walk around. This is how it was set up in part 3 when I used the HDT MK IIs as the broadcast speakers. 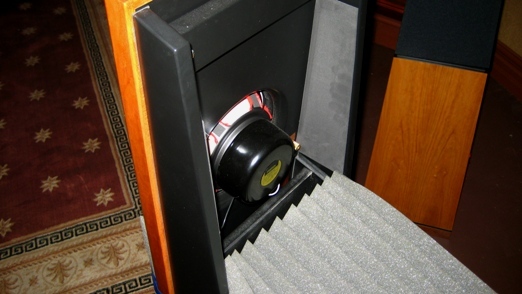 Below is a picture of the the right Open Baffle speaker and to right the HDT used as the broadcast speaker. 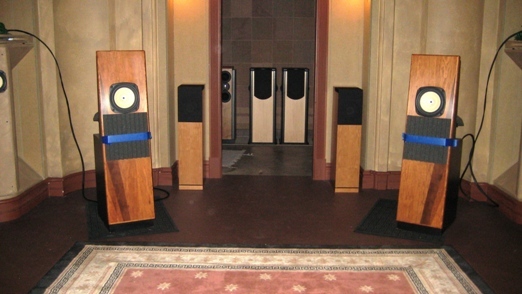 The unused Imperial SO is the large cabinet that looks as if it is built into the wall behind the open baffle speaker. This is how I set it up for the show, and this is the back of the room. When the time came to demo the ZOB all I had to do was turn the couch around. 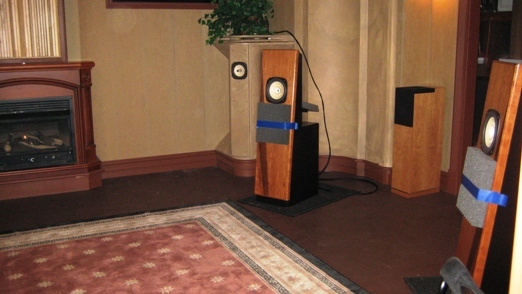 Activating the Imperial SOs in this way with speakers at the opposing end of the room has a wonderful effect on the rooms acoustics, creating a flat bass response throughout the dead center of the room with no holes and even all the way out to the boundaries. 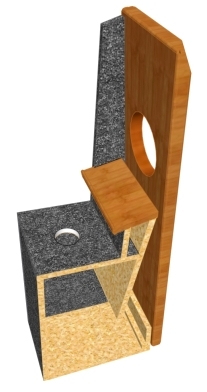 This acoustic correction effect makes the open baffles appear to have better bass, as you might expect, so a very symbiotic relationship results between the driver in the open baffle and the room. The sound stage has pushed back to whatever the recording sets it to. The Imperials are completely undetectable. The scale, weight, dynamic impact and control are so good I'm unsure if I've ever heard better. Everything about this speaker sounds right; imaging is lucid, the music breathes and you physically feel each note, even when it's just a delicately soft piano stroke it still has a physical sensation. The most complex piano works played at live volumes hold together with grace and seem to have no flaws. On music that has a bodacious bass line it just thrills your spirit and achieves a power and authority that seem to be impossible from such small speakers. This is with everything set dead flat. The microphones are no longer EQ'ed, everything seems very forgiving, there are zero feedback problems, and we are still using a cheap $200 Behringer mixer with some drum mics. The old black Stereophile Test CD with the church organ track, something I've heard at least several hundred times over the past 15 years, came off so well that I was able to construct the mechanism in my mind that opened the air flow into each pipe of the organ, hearing how each puff affects the initial attack profile of the note. In other words, I had so much detail that I could easily understand exactly what and how the sound I heard was being created, as if it had been real. You are probably wondering what the hell changed so much between parts three and four, right? Two things; the room in fact got significantly better and the driver was changed from the original DFR8 to the shielded DFR8. The biggest difference was the driver with respect to the bass response, but the room helped to tip the frequency balance away from the top end. BTW, the listening room is not yet finished. There will be much work ahead once I start measuring the room. And speaking of measuring things, I'm anxious to spend more time on the ZOB project, looking at the impedance and frequency response of the ZOB. 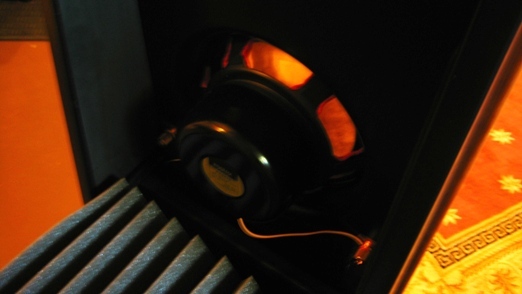 In summary, the results have changed dramatically from part three, making this a product that will be viable for the DIY market and user friendly for those who order the speakers completely finished. The options are now to use them stand alone, stand alone with a sub, or stand alone with a crossoverless broadcast system. The biggest thrill is that with this alternate shielded DFR8 the efficiency of the coupling between the driver and the chambers has increased sufficiently to make the speaker usuable on its own for many people. Even though the efficiency of the shielded DFR8 is 2 dB less than that of the unshielded DFR8, it is not noticeable. In fact, it seems louder now than it did, and that's got to be because there is so much more low frequency content than before. This validates my original idea behind the design of the chamber now that it works more efficiently. In my eyes, that's one hell of a Zen speaker since frequencies below 100HZ are all passed to a driver that doesn't exist! There's just an empty chamber. How cool is that? Not to mention the purity and phase coherency of the bass and if you add broadcast speakers, those characteristics remain the same. No powered subwoofer can achieve this seamless integration; with a line level input and active crossover, it's impossible. Interestingly enough, that means that no-one in the world has ever heard bass this clean, textured, pitch perfect and open from a moving coil speaker that is a true full range point source because nothing like this has ever existed, at least to my knowledge. To get a single eight inch driver with no crossover to create a full balance of usable bass down to 40Hz without equalization in such a narrow baffle has never been done either. It is the ultimate in coherency, supporting the ideal that for a speaker to accurately reproduce a kick drum accurately, it must be a point source able to reproduce the whole range of that drum, which is typically 40Hz out to 10kHz or more. If you reproduce the drum any other way, the subtle differences in phase angle between the main driver and the second driver are enough to alter the pitch definition and smear the upper harmonics. The constsruction characteristics of the drum can be easily deduced and the type of heads used and tuning if you're standing in front of it. On a stereo, usually not but with this ZOB approach, it's no problem. Also remember that this narrow baffle allows the speaker to disappear completely without becoming a large room reflector when compared with many other open baffle designs. As a result, it images exceedingly well. If you opt for the crossoverless broadcast system, the source for the broadcast amp is a pair of live microphones which is a whole step better than live microphones recording music and reproducing it back by CD player. So signal quality is very high going to the broadcast system and the system itself is reproducing the actual in-air sound of the main driver you're listening to in the Open Baffle. The harmonics are matched and the magic begins. It's an absolute Zen approach to speaker design. The only real negative so far that I can see, is the low xmax of our DFR8 drivers which makes them less than ideal for open baffle use. Of course, this is the challenge with all open baffle drivers since there is nothing to load the driver at low frequencies. And finding an eight-inch full range driver such as the DFR8 that has a high xmax and high efficiency is going to be difficult, unless you want to spend over $500 per driver. If we were to hi-pass the speaker at around 38 Hz we could probably prevent this problem, but I'd like to work with it for awhile and see what I can achieve with the full range driver. Part five will outline be whatever I've come up with to address this issue.